Brian S. Rosner should be a name that is familiar to many of you. He is one of the editors of the New Dictionary of Biblical Theology and has co-written the 1 Corinthians commentary in the Pillar series (with Roy Ciampa). His areas of specialty include Paul’s ethics and Paul’s use of Scripture. 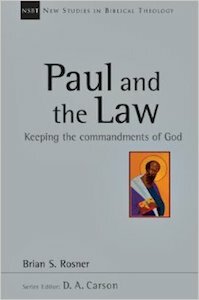 Thus, I was very excited to read his latest offering, Paul and the Law: Keeping the Commandments of God (IVP, 2013). Even though many scholars have made an attempt to explain the very difficult matter of how the apostle Paul understands the Jewish law, Rosner offers an accessible and insightful approach to this subject. In particular, he brings to the table of discussion (1) an emphasis on Paul’s ethics and (2) an explicit willingness to attend to material not only in Galatians and Romans, but across the whole Pauline corpus (and with special attention to 1 Corinthians as the subtitle of the book suggests; 1 Cor 7:19). First I will give a quick overview of Rosner’s main argument(s), and then I will offer a few personal reflections. In my estimation, even though this book is meant mostly as an expert guide to the subject without the desire to make new waves, I think Rosner’s project is distinctive based on three key theses or claims. #1: Paul did not divide the Jewish law into parts and retrieve only one part (e.g., civil, ceremonial, and moral). Rather, he rejected it all as one thing, and retrieved it all as something else (see below). For Rosner, Paul’s approach to the ongoing validity of the law was not a where (which parts are still valid), but a how (a hermeneutical shift). This may not seem earth-shattering, but some scholars have argued that Paul selects only portions of Torah that have an ongoing formative function. Rosner (rightly) argues that Paul continued to embrace the whole Old Testament, but simply re-appropriated it (all). #3: If #2 is the negative (deconstructive) aspect of how Paul approaches Torah, what is the positive dimension? Rosner argues that Paul re-appropriates Torah as (a) prophecy and (b) wisdom. Paul reads as Scripture the whole of the Old Testament, but re-reads it, as it were, as witness to the person and work of Christ. Secondly, Rosner wrote a monograph on 1 Corinthians arguing (persuasively, as many scholars affirm) that Paul does tend to point to Scripture when he wants to give counsel on living rightly before God, but Paul does not cite OT commands or laws to promote obedience. Rather, Paul offers examples or alludes to moral teaching from the OT to teach his converts. In this book, we see a shorter form of that argument. There is no question that Rosner’s above arguments, on a basic level, are a sensible and helpful way to teach about Paul and law, particularly how Paul could be so negative sometimes (see pt. #2), but also quote from and allude to Scripture positively so often (see #3). In fact, this will probably be my go-to framework for how I explain the “Paul and the law” situation when I discuss this topic with my students. I will also mention that chapters are relatively short and easy to read, there are numerous helpful charts, and Rosner includes these outstanding little one-paragraph summaries at the end of each chapter. Would that all books had such a handy feature!!! I have a few concerns with this work, but they are far from outweighing the strengths. Still, I will mention them in case they are of interest. Firstly, this did not come across to me as a polished, final work on this subject, but more of an exploratory volume. Rosner includes lots of case studies to try and defend a point, but because some of these points have a long history of debate, I am not sure he has provided enough evidence to make his case fully convincing. For example, he tries to argue that Paul reads the Old Testament as wisdom. I think his argument makes sense in theory, but it is hard to see if Paul or his readers would have thought of it that way. Rosner looks at the kind of language that is used in wisdom literature and finds some of it in Paul, but, again, some of these correlations are more suggestive than solid proof. Perhaps Rosner felt that the book would have carried on too long for the series to permit, but given how controversial the subject matter, it may have been warranted. Secondly, I felt that on a few occasions Rosner’s terminology was fuzzy. For example, Rosner almost interchanged prophecy and testimony/witness in chapter five. Most of what he wrote about in that chapter seemed to me to fit the language of testimony/witness appropriately (i.e., Torah bears witness to the gospel), but the language of prophecy seemed to confuse things more than it did help. Understandably, Paul does use the language of prophecy, but I also feared that some readers might take “law as prophecy” to mean messianic prophecies, which Rosner doesn’t mean (for all occasions of his testimonial use of Scripture). Another example of the fuzzy terminology regards the next chapter (six), where he seems to interchange “wisdom” and “ethics.” Obviously both have to do with the life lived, but I would have appreciated clarity on what the difference might be, especially since “wisdom” might be a category easier to identify in Paul than “ethics” (mostly due to modern scholarly constructions about what ethics is). Rosner argues (as he has already done so in his 1 Cor commentary) that “keeping the commandments of God” refers (ironically) not to Torah obedience, but to obedience to apostolic instruction (see p. 39, 218-219). In Rosner’s favor, we do see occasions where Paul uses entole in reference to apostolic teaching, but never is it associated with the commands of God. Sometimes it is connected to the will of the Lord Jesus (so 1 Cor 14:37), but I think it goes too far to (1) take the unique statement about “commandments of God” in the same direction and (2) have the very striking statement of 1 Cor 7:19 climax with Paul’s own teaching (neither circumcision nor uncircumcision count, what counts is what I am writing). I think it makes better sense to see this as an appeal to obedience to what God commands in a more general sense (all-encompassing), especially in contrast to simply being circumcised or uncircumcised (see David Garland, BEC). OK, that’s all the notes I have, but I wanted to repeat that this is a very useful approach to Paul and I look forward to the journal reviews to see how it is received more widely. My guess is that most evangelicals will be quite happy with it, but I would be especially interested in getting feedback from people like Mark Nanos and James D.G. Dunn who would, I image, be more critical. Very helpful review, Nijay! Thank you!